Think about all the things you need to do in Maya (or really any software). Even just for five minutes, there are so many places you have to click, buttons you need to press in a specific order to do a certain task, far away buttons that force you to move your hands all over the place, wasting a lot of time and creating a lot of frustration. Hotkeys, my friend, are here for you in your time of need. As a game animator, in particular, speed is hugely important, and hotkeys can help you quite a bit in that area. Maya’s default hotkeys do a few things right. S sets keys. Q, W, E, and R, swap between select, translate, rotate, and scale. Our beloved Ctrl+z undoes all our mistakes. Those hotkeys are all well and good, it makes sense to just rest your left hand on them and hit them as needed. But otherwise? Not very intuitive for animating. 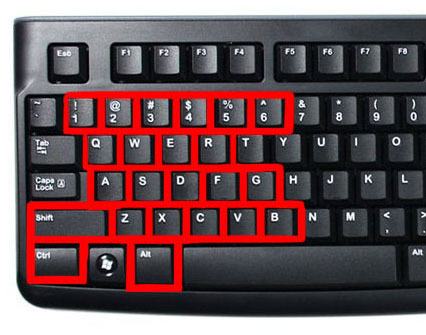 For me personally, the next most used hotkeys are flipping from key to key. By default, Maya has this as < and >. But that’s so far away from your left hand! Too far away for me. I’m lazy. Or maybe efficient? Depends who you ask. Another thing I do often is copy, paste, and delete keys. I changed these hotkeys so long ago that I don’t even remember what Maya gives you for them, but I will bet it’s something on the far side of the keyboard. But it’s not all bad. Lucky for you, Maya let’s you change the current hotkeys and create new ones! That means you can set it up however the hell you want. This is one of those hotkeys that once I started using it, I wasn’t sure how I had ever animated without it. Watching my animation playback is obviously essential, so being able to do that with a single button really speeds things up. I prefer having it as a toggle so I can just hold down on a when I want to playback and release it when I’m done. You may prefer to press it to start and to press it to stop. Luckily that’s a very easy thing to set up in Maya’s hotkey editor. I remember reading about how important it was to flip between your keys on the 11 Second Club ages ago, and it stuck with me. Stepping back and forth, especially in blocking, really helps you concentrate on your posing so you don’t have to worry about too much else. I will say, if you’re a modeler, you may want to keep 1 and 2 to their default Maya assignments and just continue using < and > to flip keys or find a couple other keys nearby that you can spare. Similar to the above, being able to step one frame at a time, regardless of whether you have a key set or not, is also very useful. Using alt as a modifier seemed to make the most sense to me. This is one that I found out about through Tim Rudder’s post on how he sets up his hotkeys. I didn’t know this hotkey existed, but now that I do, I use it ALL the time. While holding it down, if you drag left and right in the viewport, you’ll also drag in the timeline. It’s a small thing but for me, it makes a really big difference to not have to drag inside the timeline. Another one that seems like a small thing but really makes a difference for me. When I was an Animation Mentor student we had a shelf button that hid controllers, so I simply assigned that action to a hotkey instead. If you assign each of these to c, v, and x, respectively, I think you’ll find that you’ll use them quite a lot. Hitting the hotkey assigned to this command will open the graph editor, or close it if it’s currently open. Again, it’s a small thing but it’s one of those things that I don’t have to stop and think about anymore. Of course, if you prefer to have the graph editor as one of your panels, not a floating window, then this won’t be your cup of tea. Okay so maybe you’re wondering about that keypad I talked about so much in my last post. Truth be told, I don’t really use the above-outlined setup any more. I used to, but then I got a keypad and everything change. EVERYTHING. With my keypad, you can have up to 8 keymaps, meaning that you can 8 different configurations of what the keys are assigned to. How you want to switch between them is up to your personal preference, you can assign any key to be a keymap switch. I personally prefer to have that switch be the thumb pad (the circular button with the “keymaps” label). If I press it in the “up” direction, my keypad will activate keypad 1, if I press it right, it’ll activate keypad 2, if I press it down, it’ll activate keypad 3. So I have all the hotkeys I need no more than two button presses away at any time. The two other buttons you see on the lower right of each picture are mapped to alt and undo (ctrl+z), and they all stay the same no matter what. My thumb is usually resting on the alt key, since that’s the most crucial for moving the camera around in Maya. Undo is another of my most used functions, so having it always live on its own button is really nice. The “ack” hotkeys come from Aaron Koressel’s scripts which are GREAT. Go download them all right now. The add frame and remove frame hotkeys come from this post on Cameron Fielding’s blog. Really useful for timing things out. Between everything in keymap 1, I have most of the hotkeys I need to generally use. There is even room for more! My entire hotkey setup is a continual work in progress, so if you’ve got some really useful hotkeys, definitely share! Again, you’ll see some of the ack scripts here (seriously, go download them) and some other graph editor-y stuff that I use often. Fairly straigtforward. This one is still very much a work in progress but the main difference is that 4, 5, and 6 are here, which is are the texture/shading related hotkeys. At work I often have to copy and paste filenames a lot, so I have ctrl + c, ctrl + v, and ctrl + a mapped here as well. Otherwise, I’ve got a lot of open free space on this keymap. Plus, I have five more keymap configurations to fill if I want to. PLUS, my keypad allows for profiles, meaning I can have one setup for Maya, one for Photoshop, one for Dota, one for regular computing, each with their own set of 8-unique keymaps. And you can even link macros to individual keys! The possibilities are endless! As time goes by I’m sure I’ll figure out more useful hotkeys to add, but for now, that’s my hotkey setup for animating. I hope that post made some semblance of sense and maybe it’ll help you become a more efficient animator. Feel free to shoot me an email if you have an questions, I’m happy to share my knowledge! Next time I’ll talk about software and tools. Stay tuned, nerds.